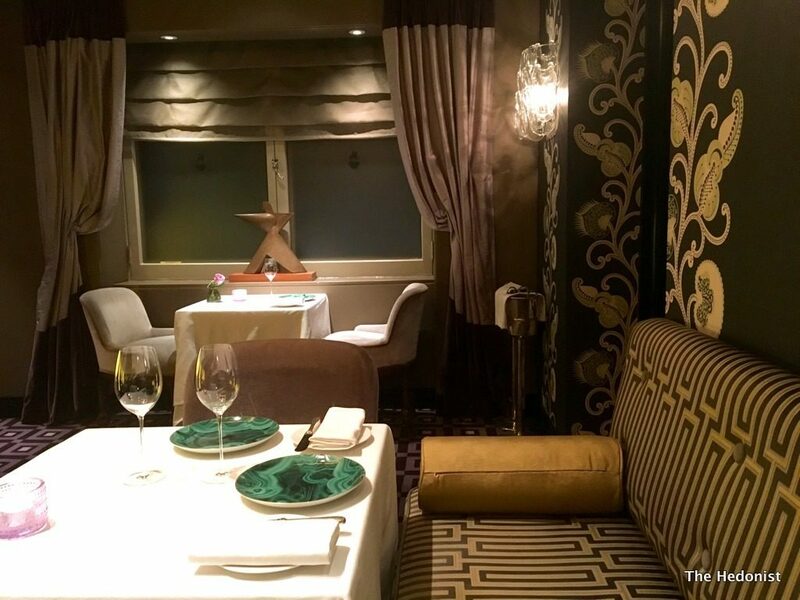 I first encountered William Drabble’s cooking at Aubergine, the Chelsea restaurant where he had just taken over from Gordon Ramsey at the stoves. The cooking was elegant and restrained, classically influenced and displayed precise sense of technique. 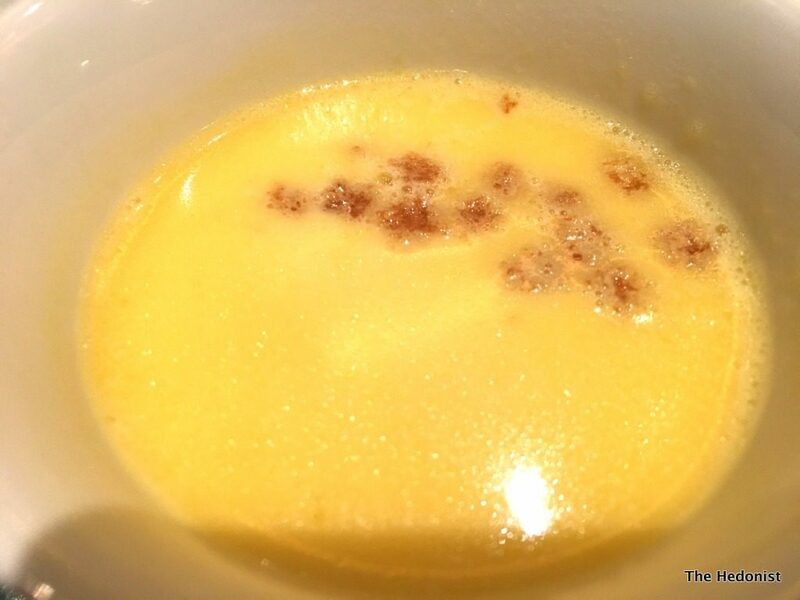 Drabble gained a Michelin star at Aubergine in 1999 which he maintained throughout his time there. Seven Park Place by William Drabble was launched in September 2009 in the elegant St James’s Hotel. 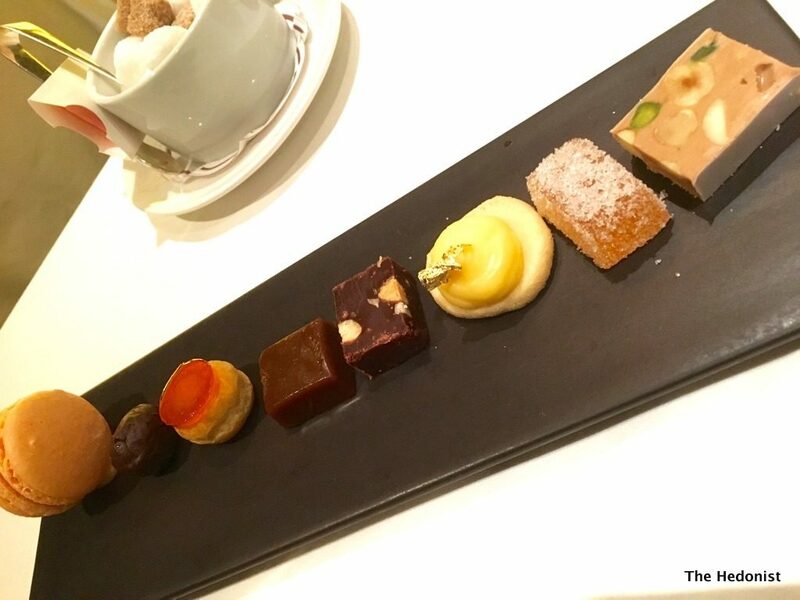 The restaurant’s food offer is modern-French using primarily British local and seasonal ingredients with a Michelin star arriving in just over a year. The restaurant has only 26 covers over nine tables and you get 3 courses for £69. I’m keen to see how Drabble’s food has evolved over the last couple of decades. 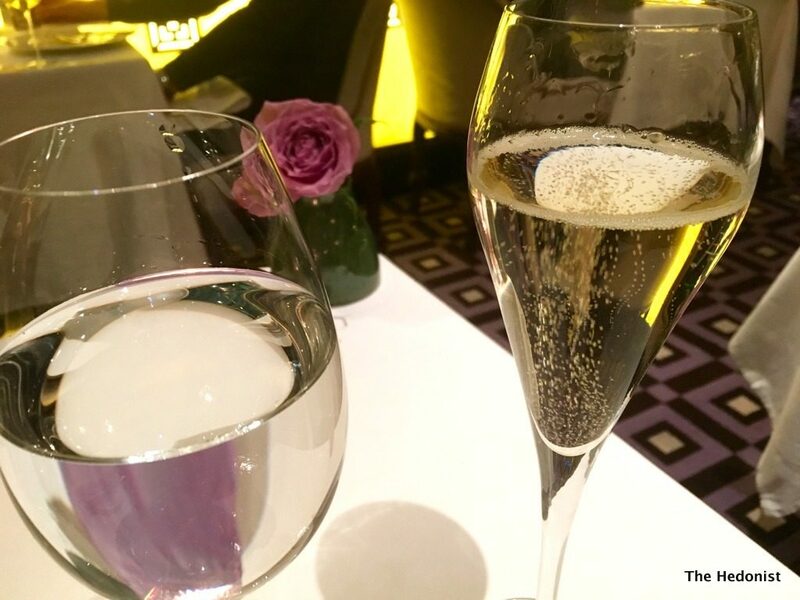 A glass of champagne came from the boutique Delamotte house (£15) based in Le Mesnil-sur-Oger. Elegantly poised with white flower and citrus notes it set her Ladyship and I up rather well. for some rather refined bread which came with a sweet Espellete pepper butter. First out was an anaemic smoked haddock consommé. It was too gentle for me – not enough smoky depth of flavour. 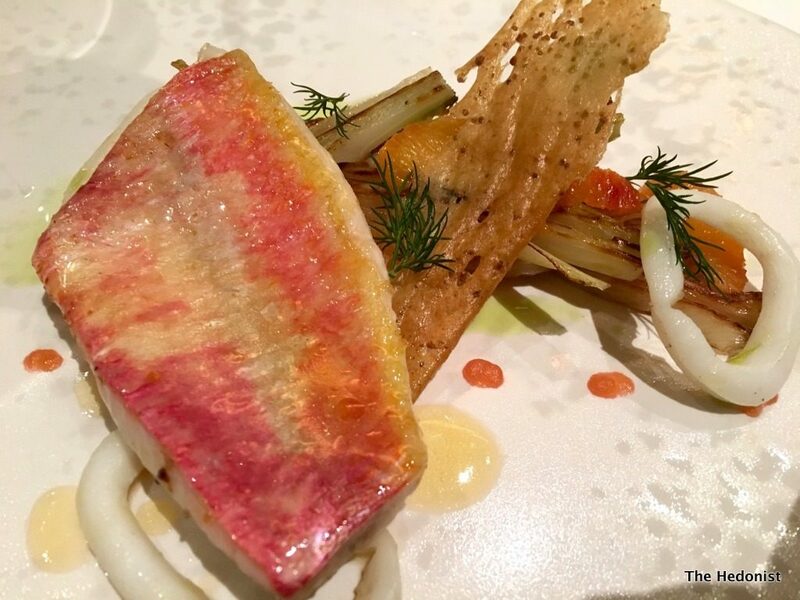 However things really picked up with a baked fillet of red mullet and calamari served with some intensely flavoured fennel and blood orange. The fish was super fresh and its sweetness of the fish was balanced by a powerful saline hit. It was a great piece of fish cooking. A dish of seared hand dived scallops with Madeira, Perigord truffles and Jerusalem artichokes was a return to unreconstructed ‘fine dining’. 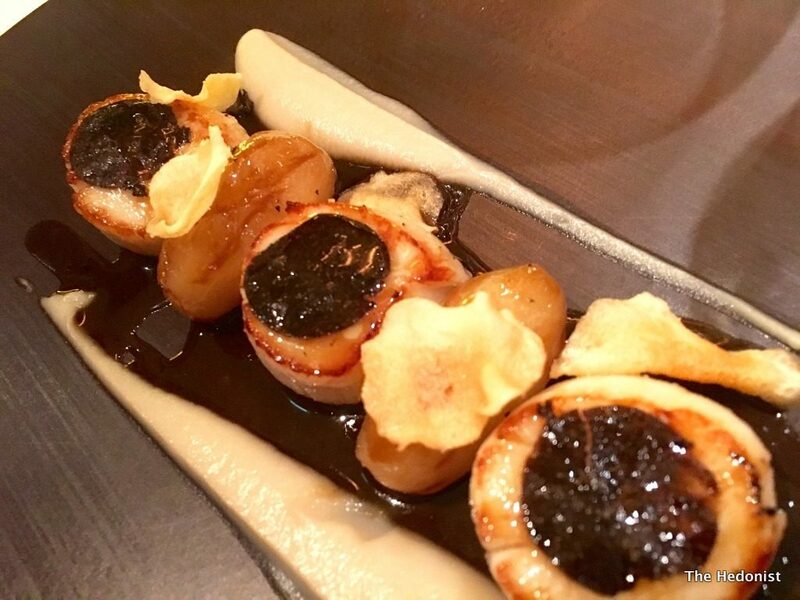 The scallops were seared on the outside and creamy inside giving the perfect base for the intensity of the artichoke and truffle flavours s with a hint of sweetness coming from the Madeira. I’m trying to wean Her Ladyship away from her innate Toryism to my distinctive brand of Champagne Socialism. I convinced her to go red with a peppery, cherryladen Malterdinger 2013 Pinot Noir – an act of gastro revolution – to accompany our seafood. Because I’m greedy an extra dish of ravioli of native lobster, with cauliflower puree and lobster butter sauce (£15 supplement) was an absolute necessity. 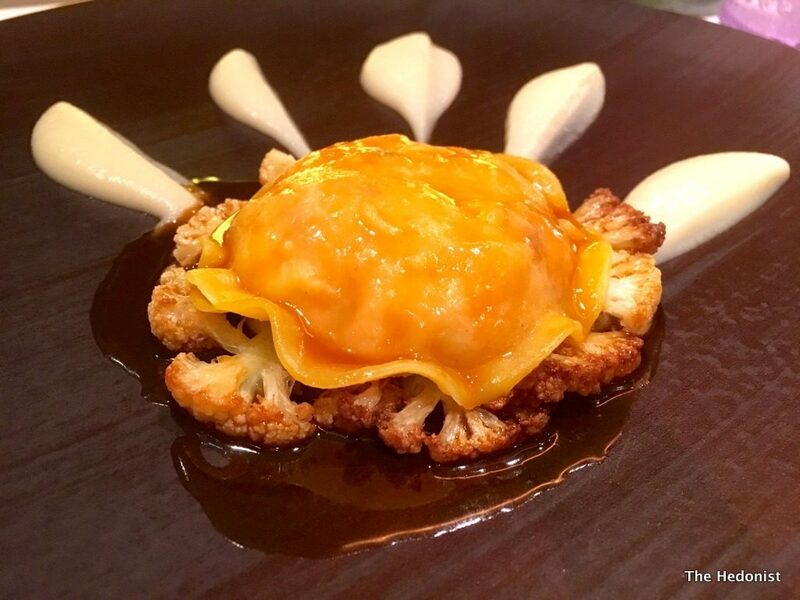 Again the balance of flavours was perfect with a sublime textural contrast between the silky, eggy pasta and the cauliflower. 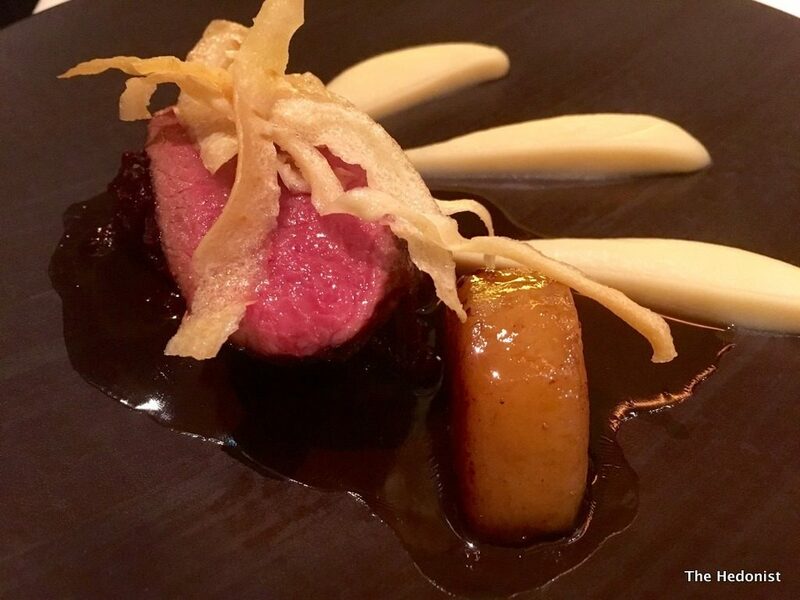 Saddle of Venison with a parsnip purée,red cabbage, potato fondant and juniper jus was a great manifestation of Drabble’s philosophy; a classic French technique put to service with top-notch British ingredients. 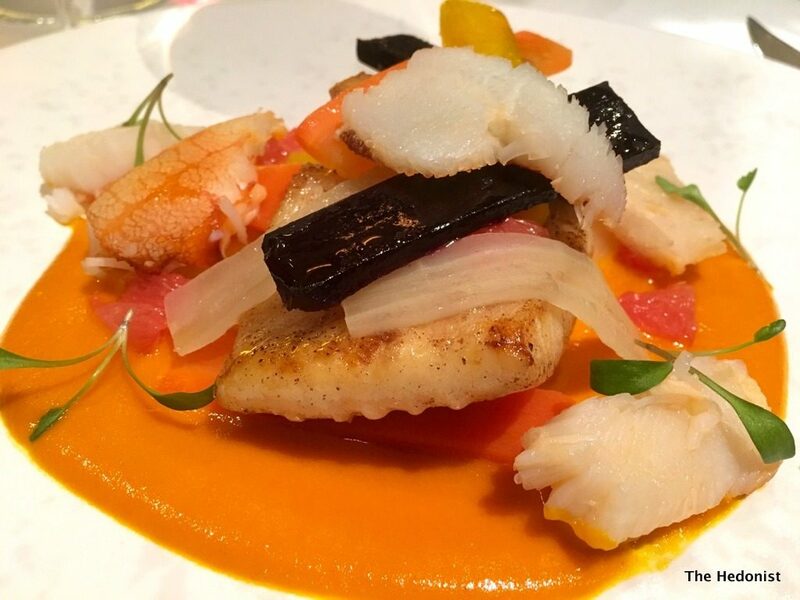 Turbot is the king of fishes and my roasted fillet had great flavour and was give added sweetness by the additional crab, carrot, grapefruit and coriander. 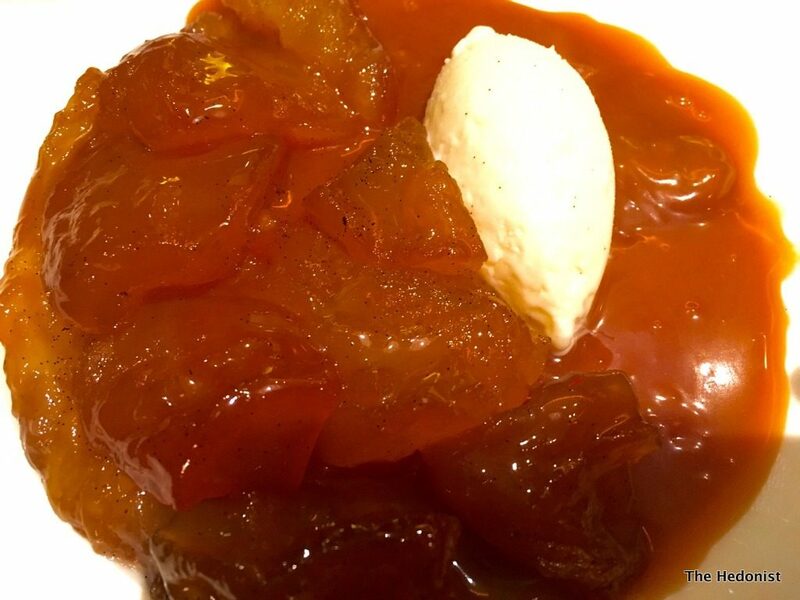 (£10 supplement) Tarte Tatin for two was almost overladen with fruit and came with a vanilla ice cream and a deliciously unctuous toffee-apple sauce in a combination so good that I was forced to finish all of the Tatin sisters’ decadent innovation. After coffee and some perfectly poised petit fours it was time for reflection. 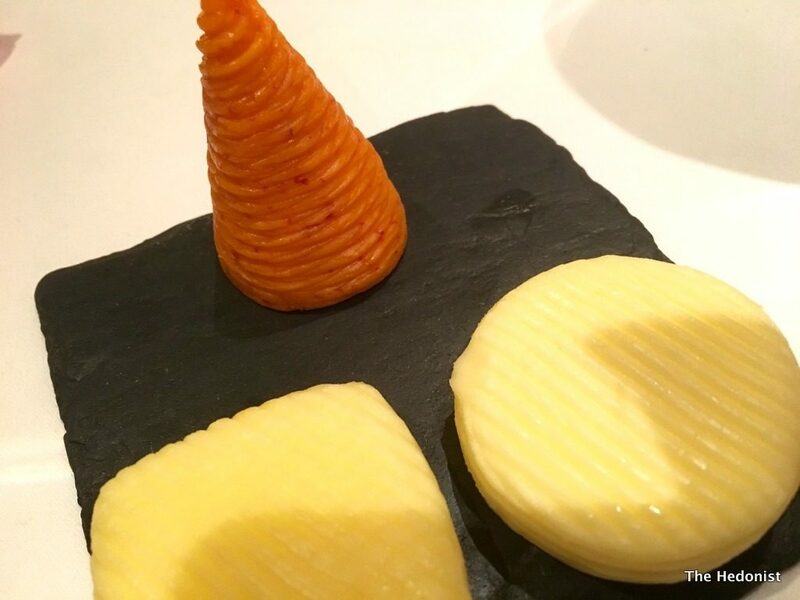 We live in turbulent times, a world in which politicians lie as a matter of course and potato crisps have their own restaurant, so it’s reassuring to come to a place where the art of fine dining is unashamedly practised. So if you need a safe haven from the vicissitudes of life then maybe you should visit 7 Park Place.